These are large units that filter all incoming water. A great choice for homes, small businesses, and restaurants. 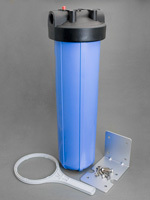 Whole house filters can be set up to treat many water issues. 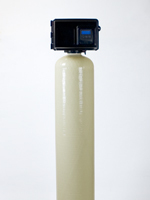 We offer cartridge and tank-style media models, reverse osmosis units, aeration systems, and water softeners. 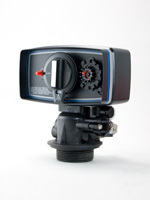 Compact cartridge-style systems are economical, highly effective, and easy to install and maintain. Tough and versatile stainless steel filter vessels, perfectly sized for residential or light industrial applications. 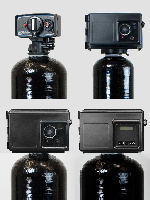 Like the compact units above, these are a great choice for sediment removal or chemical/chlorine reduction. Big Bubba units are economical, tough and simple to maintain. 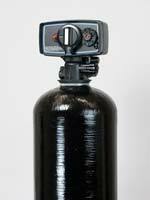 They utilize a single “jumbo” cartridge filter designed for high flow rates. 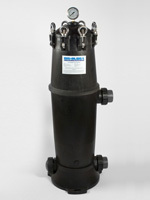 They're a great choice for high-flow-rate and high-pressure sediment removal and chemical reduction. They're also corrosion-resistant enough to handle sea water. 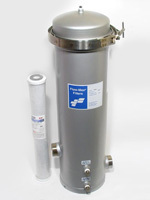 Backwashing filters use large media tanks filled with a medium that is periodically renewed by a regular “backwash” to rinse away contaminants. Our 5600 Series filters are offered with a wide range of media to address water treatment issues for both city and rural customers: chlorine/chemical reduction, iron removal, pH adjustment and more. A backwashing filter designed to remove chloramines and other chemical contaminants with Centaur® catalytic carbon and an innovative tank design. Catalytic carbon has a much better ability than regular filter carbon to “chemisorb” chlorine into harmless substances like chloride. Our high-performance units feature Fleck 2510 Control, Vortech advanced design mineral tank, and Filox-R™ — the best iron/manganese/hydrogen sulfide treatment medium on the market. 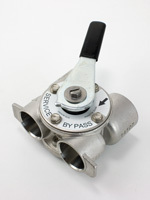 Backwashing filters offered in a variety of sizes, all featuring appropriately sized Fleck control valves. Filters are offered without media, but include everything else you need: a steel bypass valve, a polyglass mineral tank, a basket distributor with riser tube, and a gravel bed and funnel for easy installation of media. Aer-Max aeration systems are a relatively trouble-free and completely safe way to remove iron and hydrogen sulfide from well water without adding chemicals. 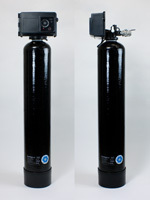 An Aer-Max system must be followed by a filter to remove oxidized contaminants. 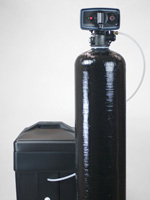 A unique filter combining aeration and media filtration in a single tank. 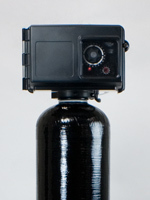 The Single Tank Aerator uses a Fleck AIO control valve to draw air into the tank, oxidizing contaminants into a filterable form. Whole house reverse osmosis units for contaminants that are difficult — or impossible — to remove with cartridge filters and media-based backwashing filters. 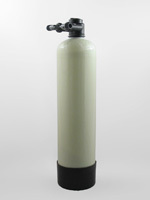 Reverse osmosis units effectively remove sodium, chloride, fluoride and other difficult-to-treat contaminants. For certain difficult waters, it's the only solution. Water softeners are ion exchangers, used to treat “hardness” ions that cause the scale, staining and spotting that can shorten the lifespan of some home appliances. In certain low pH conditions, they can also be used to remove moderate amounts of ferric iron. 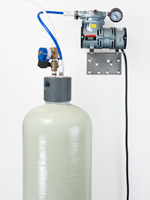 Watts OneFlow provides a salt-free alternative to a water softener for scale prevention. Scale prevention units do not remove calcium and magnesium ions from water (as softeners do) but, rather, they change these hardness minerals to a crystalline form so that they do not attach to pipes, appliances, and fixture surfaces. 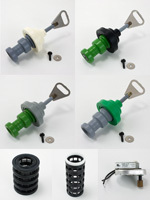 Accessories for 5600 and 2510 softeners and backwashing filters, including yokes, bypasses, media funnels and media traps. Parts for 5600 and 2510 softeners and backwashing filters, including softener piston assembly kits, filter piston assemblies, low water pistons, seal and spacer kits, and drive motors. 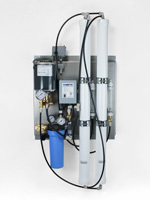 Fleck 2510 and 5600 softener and backwashing filter valves, from basic manual systems to advanced electronic SXT controls.